by the MOA and OGLE Collaborations. OGLE 2003-BLG-235/MOA 2003-BLG-53 was detected by the OGLE EWS System on June 22, 2003 and by the MOA group on July 21, 2003. The event resembled the typcal single lens light curve for most of its duration. But for a period of about a week (July 17-21, 2003; HJD 2452835-2452842), the gravitational field of the planet caused the light curve to resemble that of a double star lens. The precise shape of the light curve reveals that the lighter mass of the double lens has only 0.4% of the mass of the heavier component, which implies that the lighter component must be a planet. The curves are best fit models for various regimes of the lens system parameter space. These models are: single lens case (cyan, long dash curve), binary lens with mass ratio q >= 0:03 (magenta, short dash line), planetary lens with caustic entry before day 2835 (green, dotted line), and the best overall fit with q = 0:0039 (dark, solid line). 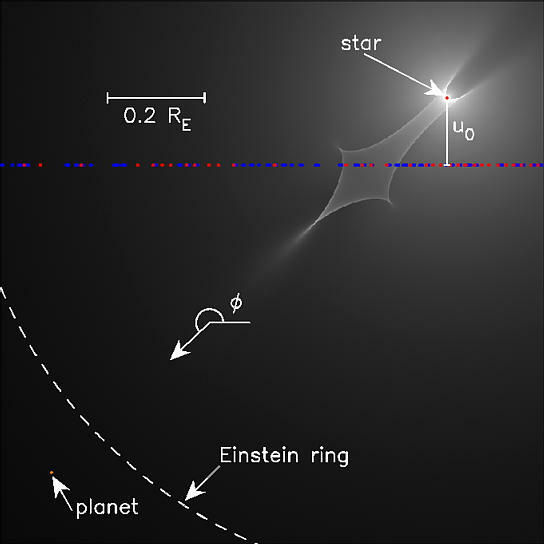 The insets show the second caustic crossing and a region of the declining part of the light curve where the best fit non-planetary binary lens model fails to fit the data. 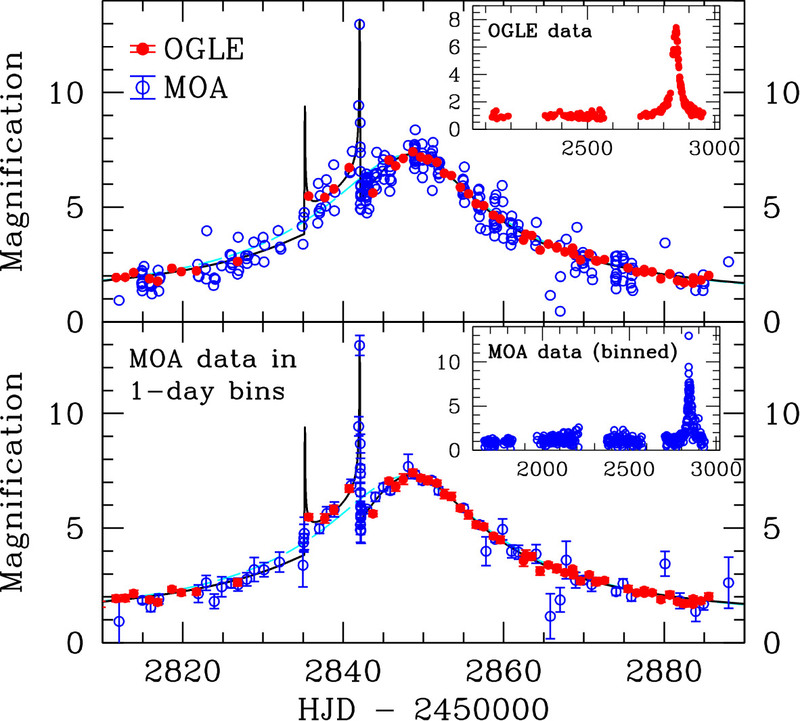 MOA data on days other than the caustic entry and exit (days 2835 +/- 0:5 and 2842 +/- 0:5) are placed in one day bins. OGLE images of OGLE 2003-BLG-235/MOA 2003-BLG-53: 20" x 20" I-band image centered on the source star when it was unmagnified (left) and magnified by a factor of about 7 (right). North is at the top and East to the left. 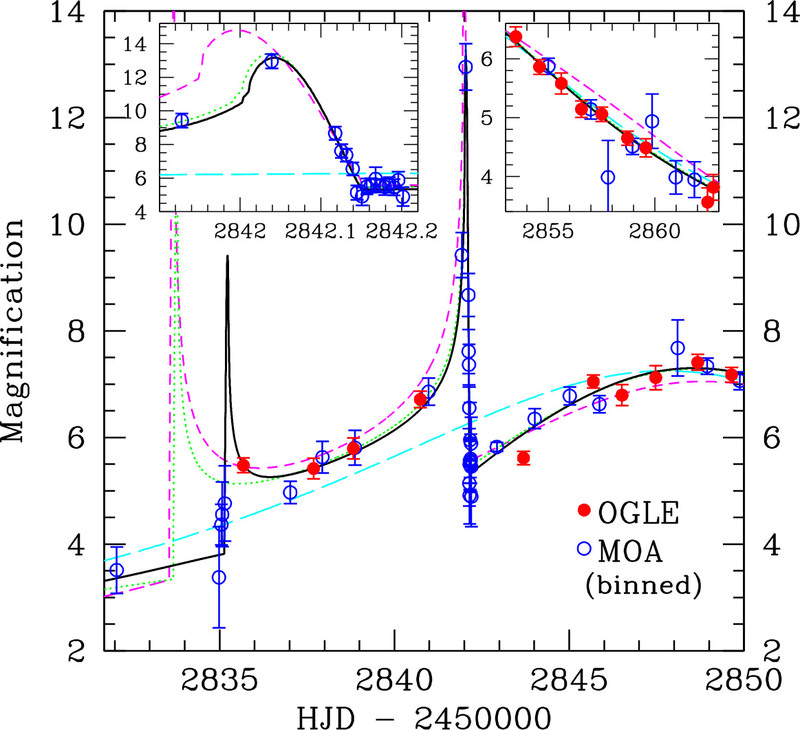 OGLE photometric data of OGLE 2003-BLG-235/MOA 2003-BLG-53 (regularly updated when additional observations of the lens field are collected) are available from the OGLE 2003-BLG-235 EVENT PAGE. I. A. Bond, A. Udalski, M. Jaroszynski, N. J. Rattenbury, B. Paczynski, I. Soszynski, L. Wyrzykowski, M. K. Szymanski, M. Kubiak, O. Szewczyk, K. Zebrun, G. Pietrzynski, F. Abe, D. P. Bennett, S. Eguchi, Y. Furuta, J. B. Hearnshaw, K. Kamiya, P. M. Kilmartin, Y. Kurata, K. Masuda, Y. Matsubara, Y. Muraki, S. Noda, K. Okajima, T. Sako, T. Sekiguchi, D. J. Sullivan, T. Sumi, P. J. Tristram, T. Yanagisawa, and P. C. M. Yock 2004, Astroph. J. Letters , 606 , PPP (astro-ph/0404309). The paper is also available here in gzipped Postscript or PDF format. Notre Dame press release on the discovery (MS Word), (PDF), or (plain text). Animation of the OGLE 2003-BLG-235/MOA 2003-BLG-53 microlensing event: (red circle in the sky image indicates planetary deviation; green circle - regular stellar microlensing.) This animation was created by Andrzej of the OGLE Collaboration. 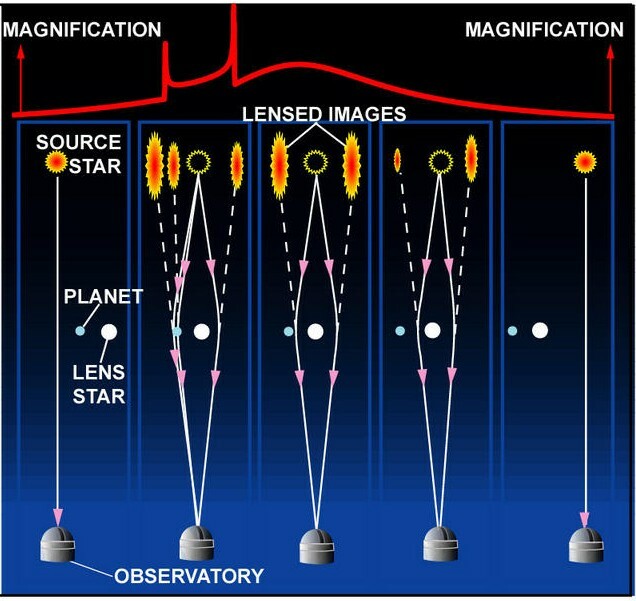 A proposal for the Microlensing Planet Finder (MPF) program will soon be submitted to NASA for review. This mission could survey the Galaxy for planets like all of those in our own Solar System, except for Mercury and Pluto. More details on this concept are available on the web site describing the GEST mission, an older version of the same concept.